The Mercedes-AMG C 43 4MATIC is now available to order in Saloon and Estate guise, adding to the recently introduced Coupé model. Prices begin at £44,460 for the Saloon. For the first time in the UK, 4MATIC all-wheel drive is also now available across the range in the C 200 (Coupé only), C 220 d and C 250 d (Sport and AMG Line trims only). The Mercedes-AMG C 43 comes with a turbocharged 3.0-litre V6 petrol engine producing 367 hp. The C 43 Saloon and Coupé can sprint from 0 to 62 mph in 4.7 seconds, while the Estate takes 4.9 seconds. All C 43 models come with a 9G-TRONIC automatic transmission – with shortened shift times – as standard. Standard equipment on the C 43 includes: ARTICO leather and DINAMICA microfibre upholstery with red contrast stitching; 18-inch alloy wheels in black; black exterior mirror housings; and silver-painted brake calipers with ‘AMG’ lettering. Specific options for the C43 include AMG Performance Seats (£1,405) and the AMG Performance Exhaust System (£1,000). Mercedes-Benz’s 4MATIC all-wheel-drive system is now also available in other C-Class models. The new drivetrain offers even better traction and driving stability. 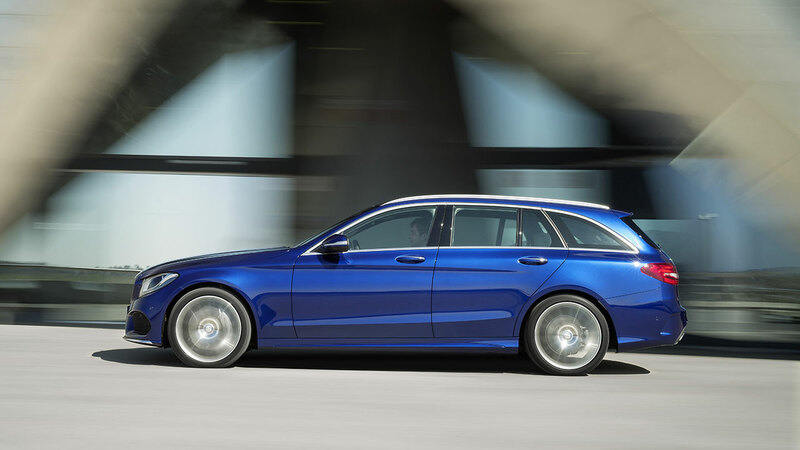 The new 4MATIC models are priced at £1,500 over their rear-wheel-drive equivalents, meaning the C 220 d Sport 4MATIC Saloon starts at £36,025 and the C 220 d Sport 4MATIC Estate at £37,225. Mercedes-Benz has also introduced a new model line to the C-Class family – the SE Executive Edition. Available on both the Saloon and Estate, it is priced at £1,295 more than the SE and includes 17-inch alloy wheels; Active Parking Assist including PARKTRONIC; chrome roof rails (Estate only); Garmin Map Pilot navigation system; heated front seats; and split folding rear seats in 40:20:40 formation.